The special features on the DVD tell us that Pocahontas is Disney’s first animated feature about people who really lived. 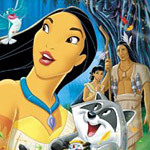 The title character was the daughter of chief Powhatan, whose tribe lived near the British settlement of Jamestown, Virginia in the early 1600s. At the age of 12, she is said to have saved the colonist John Smith from execution by her father. Since little of Pocahontas’s true story is verifiable, the filmmakers felt comfortable taking dramatic license in creating the movie’s story. In Disney’s version, Pocahontas (voiced by Irene Bedard) is a young woman, a raven-haired beauty and something of a tomboy. Meanwhile, the hunky John Smith (Mel Gibson), is portrayed as a happy-go-lucky fellow whose first reaction on meeting Pocahontas in the woods is to point a gun at her. Fortunately for both of them, he suppresses his violent impulses. After quickly breaking the language barrier, they form a friendship which turns to love. The Indians are depicted in a mostly positive light. Though battles with neighboring tribes are mentioned, they are shown as living peacefully off of nature’s bounty. The English, with their lust for gold, don’t fare so well. The only real bad guy is the arrogant, greedy colonial governor Ratcliffe (David Ogden Stiers) who embodies all of the worst qualities ascribed to European settlers. On the commentary track, the directors mention that they wanted the movie’s true villain to be prejudice. It’s a worthwhile message for a children’s movie, and the film succeeds in conveying it. The filmmakers felt that humor was necessary to lighten a such a serious story, but unfortunately many of the funny bits feel tacked-on. Rather than find humor from within the story, the movie inserts funny animals. Percy, the snooty English bulldog; Meeko, the high-spirited raccoon; and Flit, the high-strung hummingbird are indeed funny characters, developed and drawn with a great deal of care, but their antics belong in a different movie. Likewise, many of the movie’s songs seem unnecessary. One notable exception is Colors of the Wind (Judy Kuhn as the singing voice of Pocahontas). It’s a good, dramatic, show-stopping number accompanied by expressive animation. Savages is also spot-on, setting the mood for armed conflict between the two sides. Also in this DVD edition is If I Never Knew You, a duet between the couple (proving that Mel Gibson can sing), which was cut from the theatrical version after children in a preview audience seemed bored with it. The commentary by producer James Pentecost and directors Mike Gabriel and Eric Goldberg is above average, especially when they talk about the animation process. Though they sometimes repeat themselves, they seldom ramble. The rest of the extras on disc one are geared toward young children. Disney’s Art Project has instructions for making a dream catcher and drum. One of the more interesting features on this disc is a production progression which has a scene in the four stages of production (in the introduction to this feature, Goldberg helpfully explains the stages). The angle key on the DVD remote allows one to switch between the stages. The multi-language reel features Colors of the Wind in the various languages in which the movie was dubbed, with credit given to each singer. Both picture and sound are up to the Disney’s usual high standards. The DVD box says that the movie has been restored and remastered, though it’s hard to imagine that a 10-year-old movie would need much work. French and Spanish language tracks are also available on this disc.